A Goldendoodle can weigh around 45 to 100 pounds. With such, the identification of the proper diet for your pet is essential considering its age, weight, and life stage. A number of calories are needed for this particular dog breed. For an active Goldendoodle, a higher number of calories is required. In addition to the proper amount of calories needed, an ideal diet must also include the right amount of protein, particularly from animal sources. Proteins from animals usually possess complete amino acids. Also, using animal-based ingredients provide healthier fats for your Goldendoodles especially when it is from mackerel, salmon, or herring. Fruits and vegetables are also some of the important ingredients for your Goldendoodle’s diet. They provide vitamins and minerals that can help support some physiologic process within the body. It is important also to note that food containing soy, wheat, or corn is not recommended as dog food as they may pose a risk that may lead to diabetes. When it comes to nutrition for Goldendoodles, it is only important that they become satisfied with their food. Due to the fact that Goldendoodle is not a purebred but a crossbreed, you will not be able to find a dog food that is tailored uniquely to this kind of breed. As such, what you can do is to pay close attention to the nutritional requirements based on Golden Retrievers and Poodles. When feeding your Goldendoodle, avoid food such as almonds and grapes. Regardless of how much they beg, avoid giving them candies or chocolates as these types of food contain caffeine and xylitol which can be dangerous to your puppy. In addition, garlic and onions must also be avoided not only to Goldendoodle but as well as to other types of dogs. The Nutro Puppy Wet Dog Food is made of tender chicken and sweet potato ingredients that are best for Goldendoodle puppies. The chicken recipe is made from farm-raised chicken which makes it delicious and a healthy snack for your pets. The Nutro Puppy wet dog food proudly features a no-artificial preservation formulation. The recipe is composed of high-protein ingredients with real protein and other premium quality mixings with vitamins and minerals. The best thing about Nutro Puppy wet dog food is that they have a Nutro Feed Clean Feature which means all their ingredients are being made using real and non-GMO components. The Nutro Puppy Wet Dog Food especially made for puppies is an ideal nutrition food for growing pets and adult dogs. 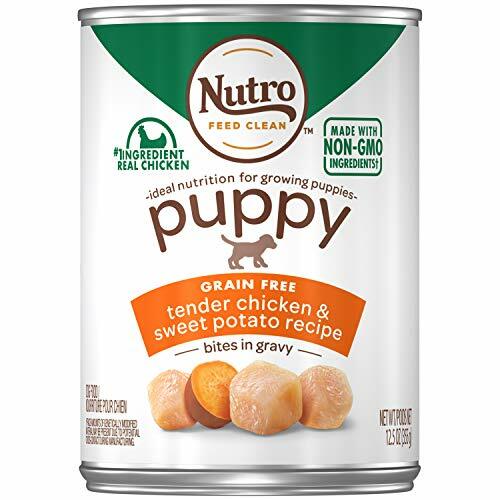 With its rich protein content, this canned puppy food is one of the best-wet foods in the market today. The Blue Buffalo Puppy Wet Dog Food contains a high amount of protein best for puppies. It features real meat content which helps develop healthy muscle growth and has DHA content which helps develop cognitive learning of retinal functions of your Goldendoodles. 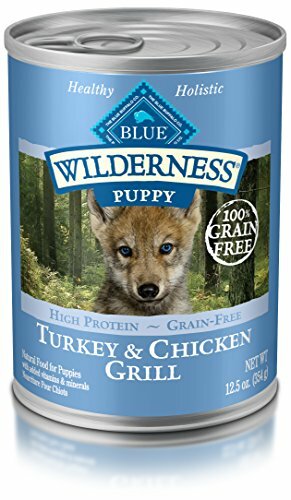 The Blue Buffalo Wilderness High Protein Grain Free Dog Food is composed of the high amount of real meat that dogs would surely love that provides delicious and wholesome nutrition for any type of dogs. This product has a high content of chicken and turkey which are mostly adored by dogs. If you have senior Goldendoodles which tend to lose some of their taste buds as they grow old, then this Blue Buffalo Wilderness High Protein Grain Free Puppy Food is an ideal choice for you. The formulation can improve a senior dog’s appetite and can maintain the functioning of the muscles. It also has enough calories content that will be able to maintain the lifestyle of your pet. Pedigree is one of the most popular brands in the market when it comes to pet food. For Goldendoodle puppies, the Pedigree Puppy Chopped Ground Dinner made of lamb and rice is an ideal choice if you want to give a delicious and healthy snack for your pets. This Pedigree Puppy Chopped Ground Dinner puppy food is formulated with DHA to help your pet’s brain develop. Made of real lamb, this Pedigree Chopped Dinner would surely be loved by your dogs. 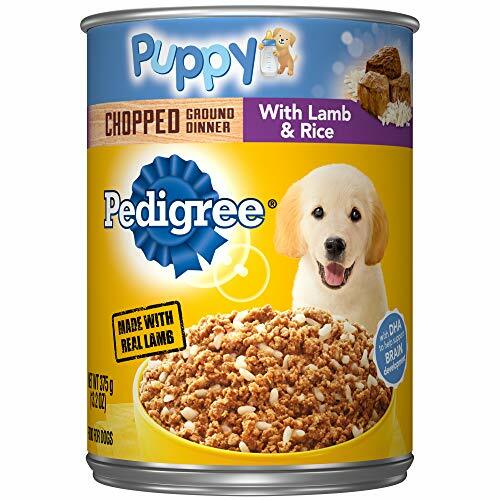 If you want to make sure that your Goldendoodles receive the right amount of nutrients they need while giving them a delicious treat they can enjoy, then Pedigree Puppy Chopped Dinner with Lamb and Rice is a great choice. The product’s formulation is designed to help improve your puppies’ skin, fur and give them the energy they need to live a healthy and active puppy life. Making sure that Goldendoodle will grow up to be a healthy, well-rounded, and a happier dog is one of the best wishes of every pet owner. In order to make this come true, the right type of dog food must be considered. Choosing the right food for your Goldendoodle can be a tricky task. It requires thorough research on the nutritional value of the dog food as well as its ingredients. The right dog food for your Goldendoodle must have the proper combination of calorie content, protein, and healthy fats in order to maintain the energy level of Goldendoodles. Quality of ingredients must also be noted in order to ensure that your Goldendoodle gets the healthiest bits of the ingredients. Make sure to select the dog food with the right size of kibbles and food that can be easily digested. Goldendoodle puppies aging from 6 months and above are given the same frequency of meals, which is twice a day, same with the adult Goldendoodle. Make sure to also groom your Goldendoodle properly and get the best shampoo for your furry friend. Also, you can read our post to find out how big your Goldendoodle will get.